We are delighted to feature Simone Berkowitz in this week’s #BecauseICare campaign. 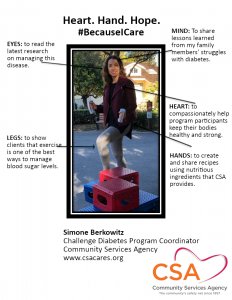 Simone has been overseeing the Challenge Diabetes Program for the past two years. Funded by the Community Benefits Program at El Camino Hospital, the program is geared toward improving the health of vulnerable members of our community who are diabetic or prediabetic .